Your cybersecurity policy shouldn't be easily circumvented through encrypted communications. With Echo Crypto.View, access to secure sites and email is monitored and controlled just like unprotected communications. Secure web sites (HTTPS) can still be filtered the same way and by the same rules. The same is true for other forms of encrypted communications like secure email (SSL). Echo's integration into the endpoint allows Crypto.View to manage encrypted data at the endpoint. Crypto.View reconciles what the end user sees and what is sent (or attempting to be sent) over the network. 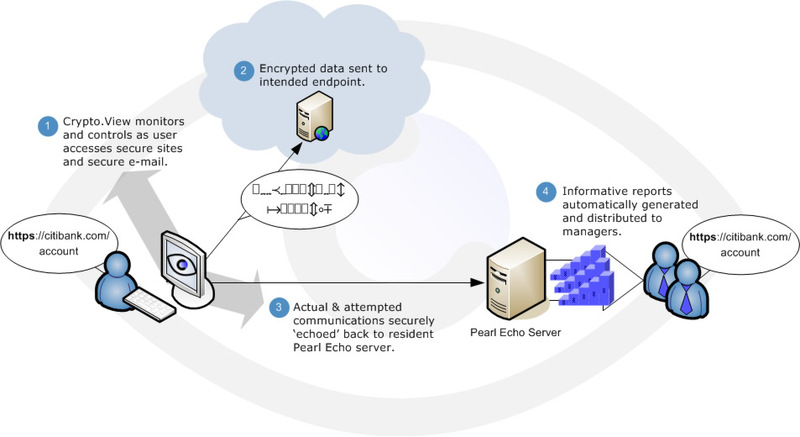 As depicted above, Echo Crypto.View allows you to securely view and control encrypted data without the use of complicated proxy servers or Internet traffic redirection. No shims. No plug-ins. No worries!